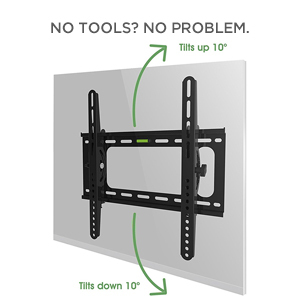 Jestik TV Wall Mount - Wall Mount TV Bracket, TV Mounts For Flat Scree - Jestik, Inc. minutes! Flat screen monitors are an ideal solution to providing strong and stunning visual imagery. 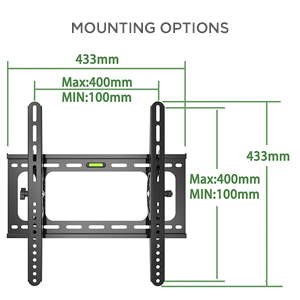 Whether it's for movie nights at home or for presenting digital media in corporate environments, the Jestik Velox Slim Series Low-Profile Tilting TV Wall Mount Bracket (Model JM-TM-LT16S) is the perfect way to keep your flat screen monitor the focal point of home or office spaces. Providing secure support for almost all types of 400x400 VESA-Compatible 23"-55" flat screen monitors weighing up to 77 lbs., you can be assured of its solid construction and built-to-last durability. For customized views, it also features an angle-free tilting function so you can swivel flat screen monitor up to 10° up and 10° down making views as clear as possible. It is also bubble-level integrated so that you can always be sure that your flat screen is mounted perfectly straight. It also offers space-saving design elements that will allow you to make room for other home or office essentials. Its slim series low-profile tilting design easily makes your monitor the focal point of any space. All eyes will definitely be the imagery flashing on the screen. Great for a wide range of applications, you can use the Jestik Velox almost anywhere, in any space that requires durable wall mounting of your flat screen monitor. 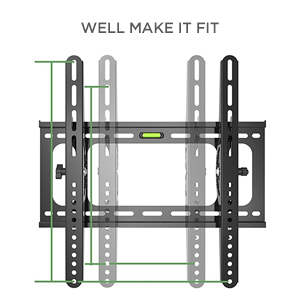 DURABLE, SOLID CONSTRUCTIONS ensures you that the Jestik Velox Slim Series Low-Profile Tilting TV Wall Mount Bracket offers lasting performance today and for years to come. Made from materials of the highest quality, it can provide secure support to 400x400 VESA-Compatible flats screen monitors up to 77 lbs. 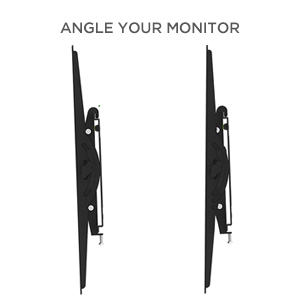 ANGLE-FREE TILTING FUNCTION FOR A WIDE RANGE OF MOTION allows you to easily tilt your flat screen monitor up to 10° up and 10° down, giving you and everyone around you perfect, crystal clear views. 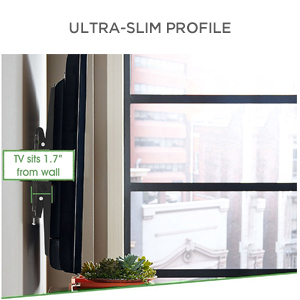 BUBBLE-LEVEL INTEGRATED feature ensures that your flat screen is mounted perfectly straight. SUPER-SLIM DESIGN OFFERS SPACE-SAVING SOLUTIONS so that your flat screen is the focal point of any space while making room for other home or office essentials. PERFECT FOR A WIDE RANGE OF APPLICATIONS AND INDUSTRIES. Its seamless design and professional look makes the Jestik Velox ideal for home or corporate settings and for virtually any situation that requires secure wall mounting of a flat screen monitor.